We have a wonderful tradition at the BACDS American Week Dance & Music Camp, held each summer in the redwoods of Northern California. Staff and camper musicians just can't get enough of the beautiful music and sheer enjoyment of playing together. A large group gets up early (or stays up late!) to play waltzes in the dining hall for the dancing and listening enjoyment of those waiting for breakfast to be served. Traditional old-time music has “Whiskey Before Breakfast”; this year we present our second CD, More Waltzes Before Breakfast. Once again, on the last two mornings of camp, we recorded the early morning waltz music. No special setup, no studio silence, no meticulous rehearsals, no retakes. 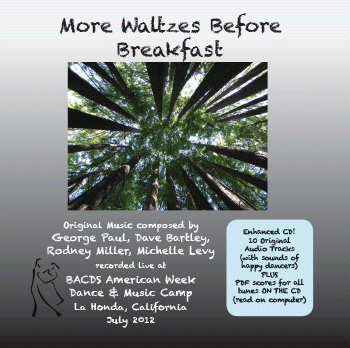 This recording captures the magic of the moment, complete with the sounds and respectfully quiet enthusiasm of the dancers waltzing in the camp dining hall before and during breakfast. Join us as we float spell-bound, enraptured by the beautiful waltz tunes, every one an original composition by one of the musicians performing.